I looove knowing the history of pieces! And I found out some interesting nostalgia for you on these doors!! Remember I told you that I found the doors this summer at the garage sale of my friend, Sue@JunkMarket Style? It turns out that she had gotten them from my other friend, Cammie@Daffadowndilly's, a few years back. After seeing the previous door post, Cammie emailed me and gave me the full scoop. She said she had rescued them from a building remodel on the Wayne State College campus in Wayne, NE. How cool is that?! 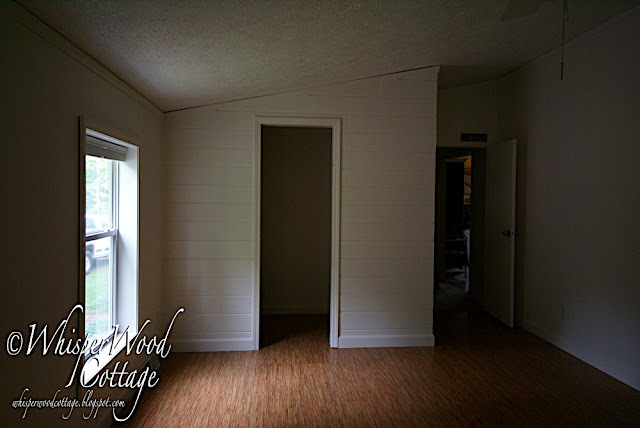 Along with the 1800s flat track our parents had rescued from an 1800s barn, this project is full of history! Does anyone else get excited about knowing the history of a junk or antique piece as much as I do? 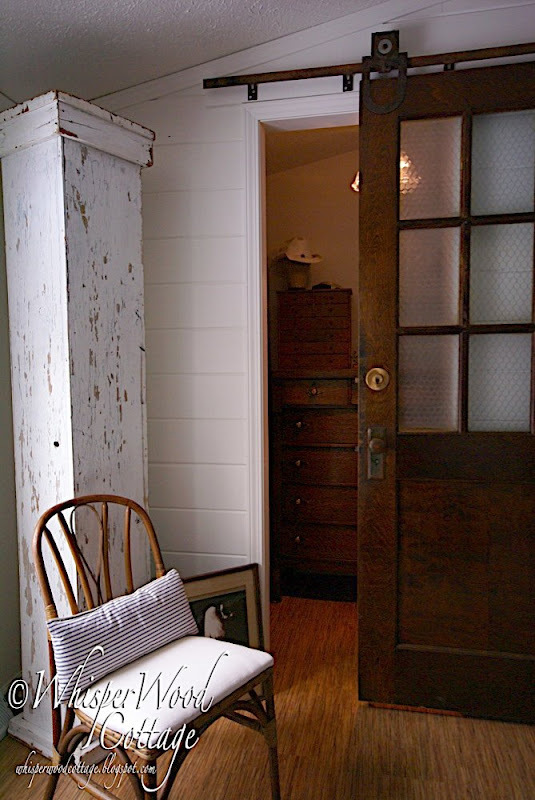 Love-Love-Love this barn door idea! And I also love to know the history of my things. It brings life into them. That looks so cool! I told hubby that I need one of those barn doors on tracks for my laundry door. I love to know the story behind the junk, that makes it even more special, that's why I had to find out if those were the doors, each piece you find is like a piece of yourself, I loved them and now you can love them as well as everyone who sees them is loving them!! OMG! How lucky are you to have TWO? I just love this idea and the history behind it makes it even better. Congrats on moving along on the project. Love the history, your room is going to be fantastic! 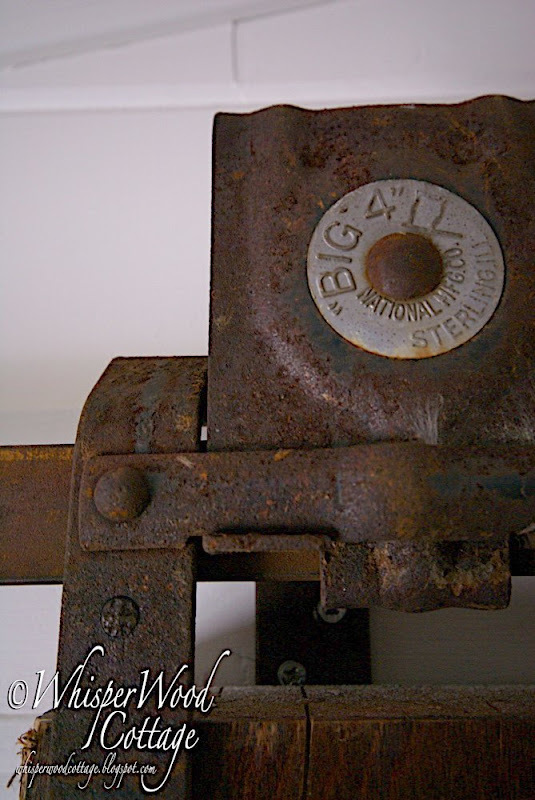 Amy-This is gorgeous and I love knowing the history behind anything old. I always wish they could "talk" and tell their stories! Knowing the history of something makes it even more special and valuable. 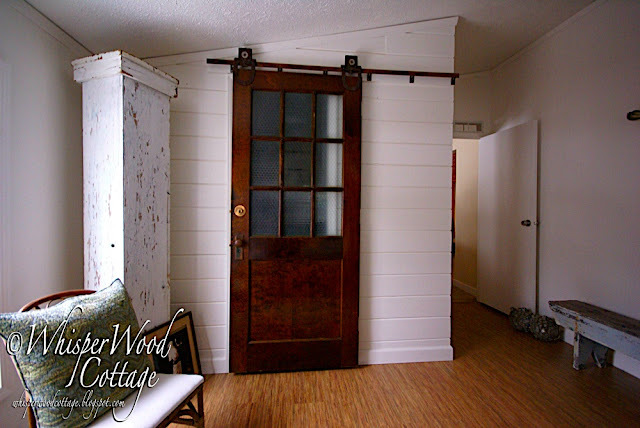 I love the barn door--how creative and "out of the box" to use it on a closet! What an awesome piece with so much character! That's why blogging is so much fun - you never know what you'll learn! Oh, this is just wonderful! I loved reading about this piece! I'm sure you're loving this! Great job. 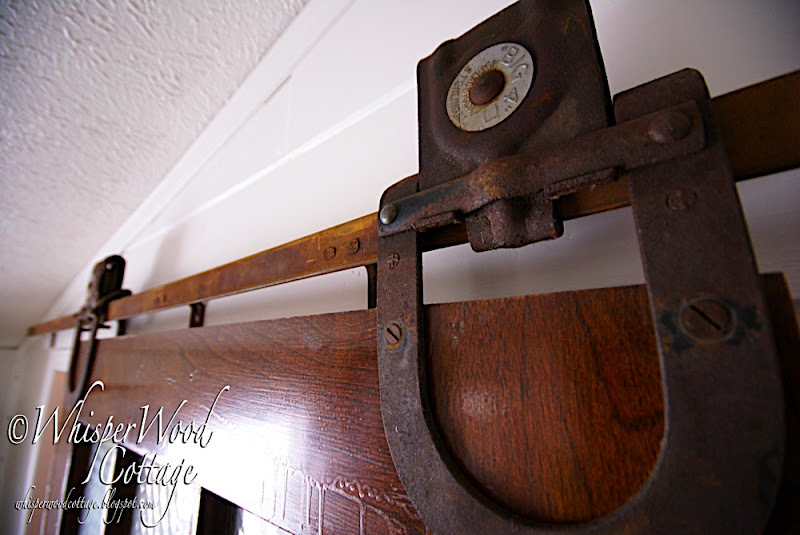 that is so darn cool ... love the hardware on the door ... love the transformation completely! this is just such a great project! I found two vintage doors this weekend so I am sucking up ideas! P.S. The new booth photos look fantastic!! Beautiful displays! My kinds think if something wasn't built this week, it's no good. We have to respect such pieces. I love the barn door--absolutely gorgeous. I would love to showcase your bedroom on my Its So Very Cottagey home tour some time-let me know what you think. You already know I am a fan of your blog and you. Loved hearing the story behind the doors. What wonderful history you have in your home. This is unbelievable!! I just clicked on your post and I am so glad I did! This is just the kind of project I love. So creative!! 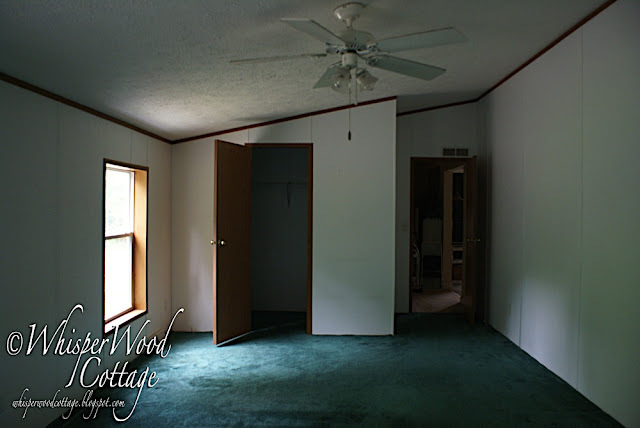 What an incredible transformation of the bedroom too. It's gorgeous!! love it! it looks so wonderful. You have quite the handy husband. Wow, Amy. I can see why your thrilled. These doors add so much lovliness, character and originality to your whole overall make over. So very cool. And yes, I love the history behind things I buy. It just makes a special connection to the object. I'm a detail type of girl, so I love the details. I love the history on anything! You, my sweet girl, have added to the history on these doors. The fact that they are a mix of you and your folks make them even more interesting. Throw in the part about getting them from a friend and it makes them even more special. They now have quite the pedigree and the value just shot up! WoW! I love how that looks and that you found the origins-terrific! I can't wait to see the whole room!Great photography too, BTW! That is so very cool! I love it! That's an awesome remodel. I know you guys must be so proud of the work you've done. Looks great! Amy, the doors look great! I love them. The room is just awesome. Great ideas. I love knowing the history of a piece also. It makes it extra special then. I absolutely love this! Such a huge change. Stunning! If I could do something like that in every room, I would. I just love the character and the life that doors like that bring into a house. Great job! Simply awesome. I like to read ya story behind the doors. The history is great. Thanks for sharing all the information. Love 'em! Knowing the story behind the finds is always marvelous, too! Love those doors! I could use something like this in my office. I've never seen a sliding door like this one and i love it! Keep inspiring your soulful beauty.